The Devils seem to be poised to open training camp with a plethora of mediocre defensemen ready to patrol the blueline, but today the weeding has begun… Vitaly Vishnevski has become the first blueline-casualty as he has been placed on Waivers. I can’t say I’m surprised, it seemed like Vish was constantly lost when on the ice last season, and often found himself a healthy scratch. His biggest fault in my eyes was constantly taking himself out of position because he was looking to lay a big hit. It’s been his Achilles ever since he was drafted (Anaheim/1998). Well, there’s a spot open on the blueline – which will definitely make training camp that much more exciting. Did this move open the door for Matt Corrente… ? 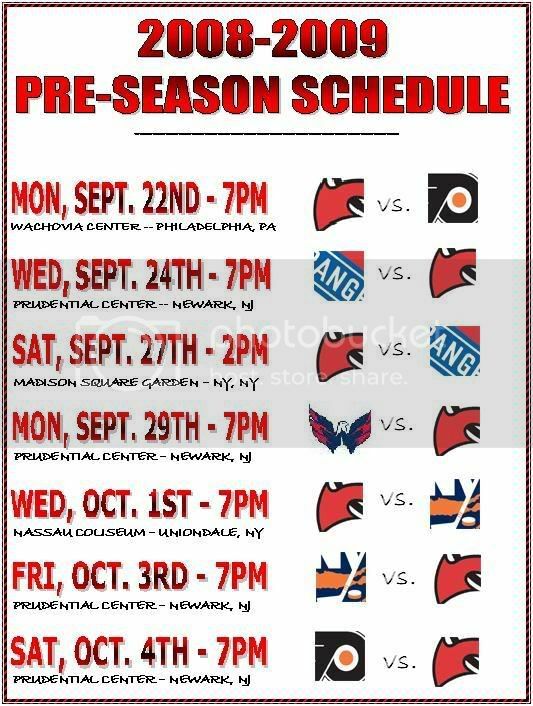 …four games at The Rock is tantalizing, however I’m a little disappointed that there aren’t any games scheduled for Bridgeport, CT or at Sovereign Bank Arena. The real fun gets under way October 10th from Prudential Center with the New York Islanders coming to town. EDIT: My apologies for the absolutely horrid quality of the image. Gotta love Photobucket.